Drew Angerer/Getty ImagesElina Vives unveils the Galaxy Watch at Samsung Unpacked. The Galaxy Watch is a fitness-focused smartwatch. It’s waterproof, has LTE connectivity, and gets “several days” of battery life on a single charge. The Galaxy Watch will come in two sizes and three colours. It will be available to buy on August 24 and starts at $US330. With the Galaxy Watch, Samsung is abandoning the Gear branding from its smartwatches. “It was about simplification,” Elina Vives, Samsung’s head of marketing for computing, audio, smartwatch, and VR, told Business Insider. A version of the Galaxy Watch will have LTE connectivity, which means you can make calls or listen to music without being tethered to your smartphone. The watch will be able to charge wirelessly on Samsung’s new Duo wireless charging pad, which can charge a smartphone and the watch at the same time. Like Samsung’s past smartwatches, the Galaxy Watch will run Tizen OS, Samsung’s smartwatch operating system. 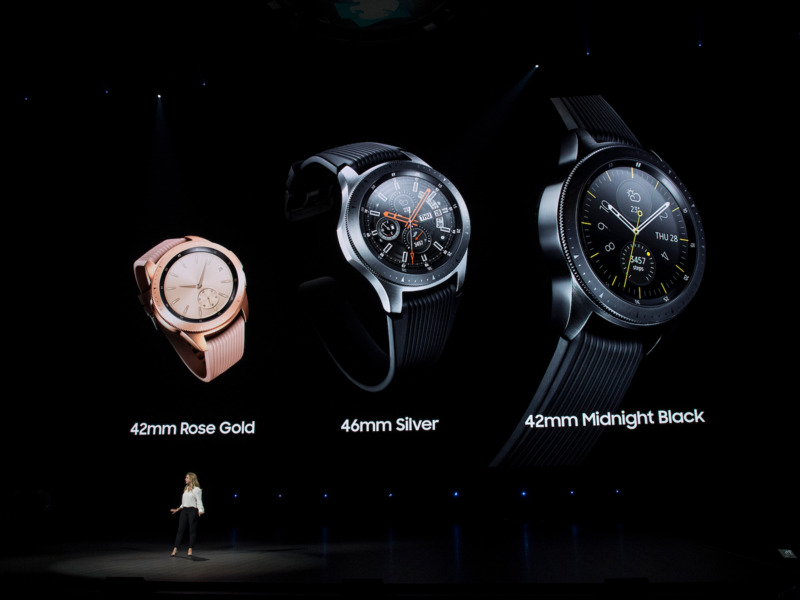 The Galaxy Watch has an AMOLED display and “military-grade durability.” It comes in three colours – silver, black, and rose gold – and two sizes: 42 mm and 46 mm. The 42 mm watch will cost $US330, while the 46 mm watch will cost $US350. Both watches will be available to buy on Amazon, Best Buy, and Samsung.com starting on August 24. However, the LTE-enabled watch won’t be available until later this year. 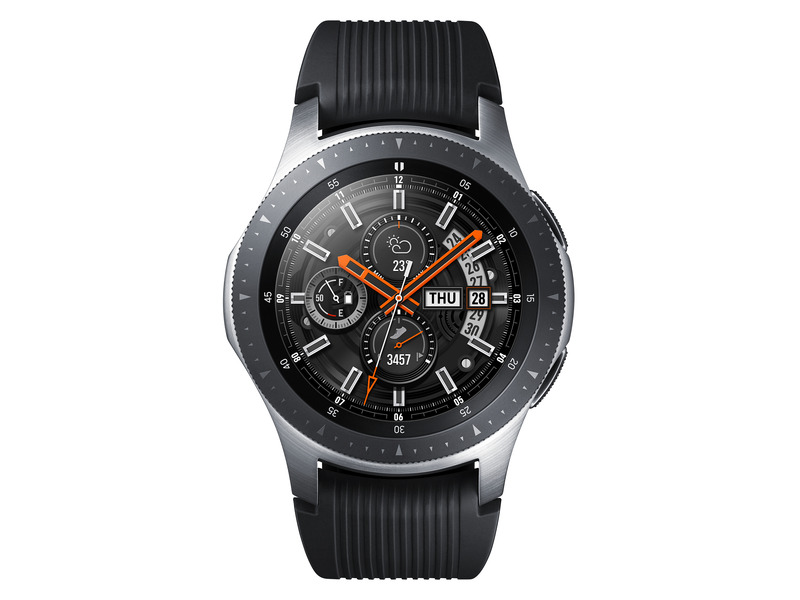 SamsungThe Galaxy Watch in silver. The Galaxy Watch isn’t Samsung’s first wearable, but it’s the first with the Galaxy brand name – in the past, Samsung’s smartwatches have been under the “Gear” branding. “It really just makes sense from a nomenclature standpoint, from a brand equity standpoint, that when you interface with Samsung devices, you’re interfacing with the Samsung Galaxy,” Elina Vives, Samsung’s head of marketing for computing, audio, smartwatch, and VR, told Business Insider. “The other reason is that, it’s pretty obvious I think, but people go, ‘Gear?’ Our consumers are used to it because we’re on Series 3 [of the Samsung Gear watches] but it was also about simplification and making sure we continue to bring new consumers into the category,” she said. Current Gear products – like the Gear Spot watch or Gear VR – will keep their name, but as time goes on, Vives said, Samsung will lean into the Galaxy name.